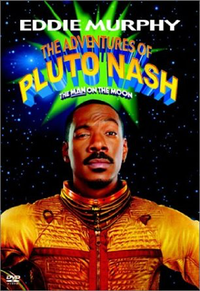 Eddie Murphy in the role of Pluto Nash plays to his comedy type. The first scene has Jay Mohr playing polka and top of the predictable list is that Nash makes fun of him wearing a dress. In another scene he peels off a stack of paper money featuring Hillary Clinton. He’s brash, slightly world-weary and somewhat insane. In the context of the role of Pluto Nash, this acting style fits. Rosario Dawson in the role of down and out aspiring singer, Dina Lake, is Nash’s perfect balance. Lake’s father was a crony of Nash and she appeals to him to help and he does what he can to help. When the times comes, she’s with him looking for answers. Also by his side is Nash’s club android, played by Randy Quaid. Cloning and making oneself better with enhancement is a heavy theme throughout the movie, but the physical ideals are modern and sadly unchanged. John Cleese has a cameo role as “James” the AI of a limo that Nash, Dina and the android steal to make an escape. The addition of Cleese to any movie is a step up. He is a comedic genius and his timing is impeccable. John Cleese as a limo is exactly what every movie needs. In yet another brilliant casting move, Pam Grier plays Pluto’s mother. Grier was a perfect fit to a movie that never takes itself too seriously. [easyazon_link identifier=”B00A7E3TCK” locale=”US” tag=”rabidreaders-20″]The Adventures of Pluto Nash[/easyazon_link] bombed in a big way at the box office. It won both worst picture and worst actor in the 2003 Raspberry Awards. Should this deter viewers? Something had to win worst, and I cannot think of a better candidate released in that year than [easyazon_link identifier=”B00A7E3TCK” locale=”US” tag=”rabidreaders-20″]The Adventures of Pluto Nash[/easyazon_link]. That doesn’t mean the movie isn’t worth watching. If you’re looking for something mindless to watch in an afternoon pick this movie up. The Adventures of Pluto Nash is available on Amazon Instant Video.